Here is a document of some interest to the left. For the DHAC was one of the activities which symbolised the – as it were – left turn of Sinn Féin in the 1960s. It was explicitly positioned towards agitating against the housing shortages in Dublin in the mid to late 1960s. This sort of populist mobilisation around ‘bread and butter’ issues was crucial to the later self-identification of Official Sinn Féin, and representative of the abandonment of the central issue of combating partition to those who disagreed with the ‘political’ path such as Provisional Sinn Féin (although not entirely, since there were more diverse strands to that latter position than some often give credit). That the DHAC was home to a broader range of members from a wider constituency on the left doesn’t as such undermine either thesis, but perhaps point to it acting as a vehicle for competing, and complementary, approaches. Any organisation that could bring together the late Seán Ó Cionnaith (who I well remember from the 1980s) and Dennis Dennehy had to be, per definition a bit more complex than some histories seek to present. This short document from June 1969 gives a flavour of the DHAC. Although far from overtly party political, there is no mention of Sinn Féin, it is on all other levels an intensely political document, not least in the attacks on the Labour Party in particular. We will report on the latest developments in Landlord racketeering, evictions, squatting etc., as well as publicising the numerous successful agitations we are waging on behalf of the homeless and rack-rented workers of Dublin. One wonders was it sent? Consider this interesting overview of the history of the DHAC from DR O’Connor Lysaght in 1976 from Arguments for A Workers’ Republic, a great resource in itself, [scroll down]. I can’t say whether it’s entirely accurate, perhaps others can fill in the details. The early days of BICO…there is something about all this in this in the current IPR. There was also a Cork Housing Action Committee..
Denis Dennehy was in the ICO. They were republicans then. He squatted in Mountjoy Sq to draw attention to the problem. There was a similar org in Dun Laoghaire. Housing was much worse then. I remember Padraigh Yeates bring me down Foley st near Connolly station. Truely Dickensian. Ballymun was built to alleviate the problem. An org that actually achieved something and caught the support of many layers nad grouping in society. Dennehy is dead now. I would regards him as a hero of the times in spite of some of his politics. Cheers Sean. Interesting reading no doubt. Jim, can I say again just how great is AFAWR which is now under resources? Dennehy must have been a good guy, whatever his … er… interesting politics… Mind you so was S Ó C.
Ta Garibaldy. It’s a cracker isn’t it? Ed is right that there were those committees in Derry and Belfast. The Belfast one was, as far as I know, essentially Republican Clubs, while it was the Derry Housing Action Committee that organised a lot of the marches up there, and which was a coalition of republicans and people like Mc Cann, plus independents. Hume et al stepped in to take over it. I think that the involvement of the movement in things like this helps refute some of the sillier notions that NICRA was designed as a secret plot to overthrow the state. Rather it was to radically reform it, while republican involvement would interest people in republican politics. Ó Cionnaith was a great man, who throughout his life put his money where his mouth was, and worked tirelessly on behalf of other people. His sudden death was a great loss to his local community as well as to his family and party. It was in fact the comments on his son’s interview with MacGiolla that first led me here I think. And in fairness to S Ó C, there was nothing shall we say exotic about his hugely sincere and rather admirable brand of socialist republicanism. Tireless is the word that comes to mind. See WBS, I’m not really sure what you mean there, but I will say that we should not forget that it was him who was international secretary for a long time, and that it was the USSR that identified and treated some of his health issues. There’s a pretty good novel called _Cry of Morning_ which dates from this era, and includes a lot of stuff on the housing campaigns. This is in relation to the wider changes in Dublin and Ireland in the Lemass years and after. Worth reading if you can find it in the second-hand bookshops in the capital (if there are any left, that is). The author, one ‘Brian Cleeve’ concludes by predicting that the future is a ‘red Ireland’. Ah well. . .
Of course mankind will inevitably produce something better that capitalism. I’s gonna take a few more years mind you, though the Nepalese have just set out on that road. I’ve often wondered if we inevitably will. I tend to think technological improvements, human rights, democratisation will lead towards ‘better’ more socially oriented outcomes, but I suspect they could almost equally go in a sort of rightward direction, something akin to the libertarian approach. I remember meeting Seán Ó Cionnaith when I was doing research in Ballymun in 2002. He was generous with his time and support, and I was hoping to visit him again when I heard he had died, a few weeks after moving into his new flat as part of the regeneration of the area. As Garibaldy says, he lived his socialism – this made him nobody’s fool as far as ‘community involvement’ in the regeneration was concerned. He and Kathleen Maher were both great losses to Ballymun. Is the Squatter archived or is this from a private source? I got a copy on loan from someone’s private collection. I’m not sure to be honest if it’s archived. BTW, just taking uip where Jenny left off, I remember Ó Cionnaith from the WP days… I’d have had a lot of regard for his work in the community. 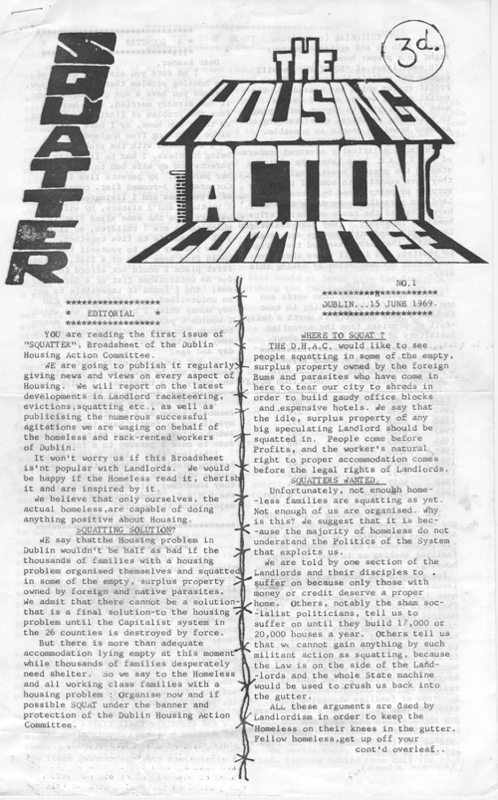 Just to let people know, the Derry Housing Action committee produced a similar thing to this in newsletter form and is available in PRONI along with mainly civil rights material from 1969.I think it was called ‘Reality’.